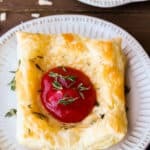 These Savory Cheese Puffs with Raspberry Sauce are perfect as appetizers, snacks, or as a side to a bowl of soup or salad. Shred the cheese and add to a small bowl. Strip the leaves from the thyme until you have 1 tablespoon full and mix into the cheese. Roll out the puff pastry to smooth creases and cut each sheet into 6 even sized squares. Place the puff pastry squares on a baking sheet lined with a silicone baking mat or aluminum foil. Divide the cheese evenly onto the centers of the 12 puff pastry squares. Fold the corners in slightly and brush the puff pastry with the egg mixture. Bake for 15-17 minutes. The pastry will be puffed up, but will quickly deflate once out of the oven. Add the raspberries, water, sugar, cornstarch mixture, vanilla extract, and lemon juice to a saucepan over medium-high heat. Bring to a boil, then reduce the heat to low and simmer until thickened, stirring often - about 5 minutes. Optional: to remove the seeds pour the sauce into a fine mesh strainer and use a spatula to press it through until just seeds are left over. Top each cheese puff with a teaspoon of the raspberry sauce. Garnish with extra thyme, if desired. Be sure to set the puff pastry out about an hour before you begin baking to allow it to fully thaw. You can use any herbs you prefer. Basil, rosemary, and sage are great choices. To make smaller puffs, cut each square into quarters and follow the remaining instructions, reducing the cooking time to 12-15 minutes. Store extra cheese puffs in an air-tight container in the refrigerator. Reheat the puffs at 350°F for just a few minutes. Can you make cheese puffs ahead of time? You can make the cheese puffs ahead of time, however, they taste best warm or at room temperature. Can you make raspberry sauce ahead of time? Yes, you can make the raspberry sauce ahead of time and store in the refrigerator. It is recommended to warm it before using it to thin it back out.